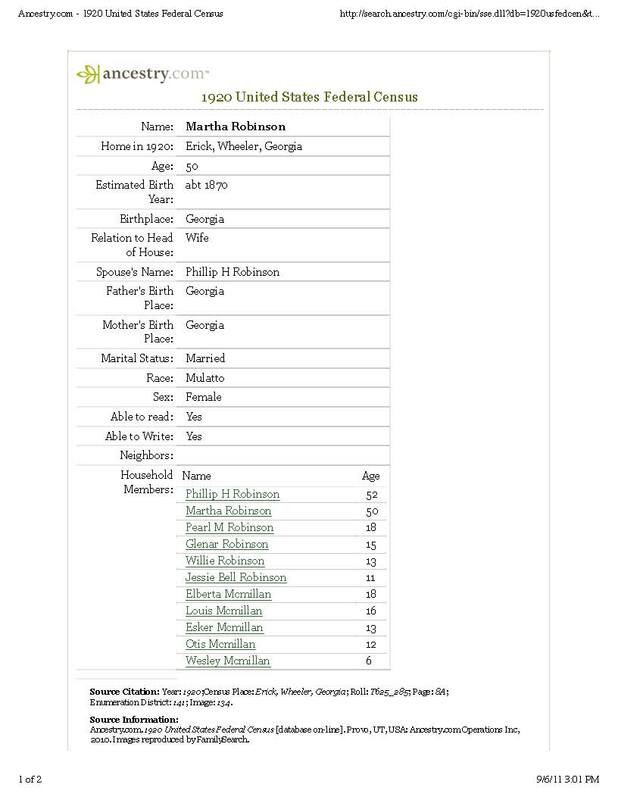 My Family Affair: Martha Clark McMillian - Robinson ? Martha Clark McMillian - Robinson ? About a week ago I discovered through census data that Marth Clark McMillian had remarried after the death of her husband, William McMillian. This is something that I had never heard before and I believe that there are not too many people are aware of. Here it is in black and white. When I called my mother to ask her about this she initially told me that I was wrong but after mentioning the name of her spouse, she then remembered that her mother use to talk about 'old man Robinson'. It looks as though they simply merged their families together. This last week I have spent countless hours scanning documents as well as 100s of photos to my ancestry.com site with both of my family trees. There is still so much work to be done, but I am 6 generations in, and need to go further back. However it looks as though that is going to take a great deal more legwork. Up to this point I have been able to do this via the internet after writing down the names and stories given to me by the elders in my family. I was able to start this journey at the Historical Society in Savannah. I suspect that I will begin to hover over a great deal more books, journals, and newspapers. Even though this is all good for the spirit, I am sure that it will take a toll on the eyes as well as the posture. Bring it on.